The DLED9.1SE-BI Studio Edition Bi-Color LED Light Head from Dedolight is a capable 3,200-5,600K LED light source with quality color reproduction due to a CRI of >91. 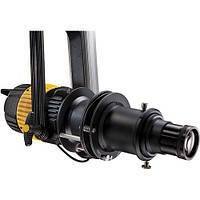 This Studio Edition comes on a U-shaped yoke mount with a 5/8" receptacle and 1 1/8" stud for a straightforward mounting setup as well as an AC power supply. The DLED9.1 is focusable from 50 to 4° and can be continuously dimmed from 100-0%. Additionally, it can have it's color tuned from 3,200-5,600K and has a low power draw of 90W.